I have been a huge fan of Noodle & Boo products since having my littlest guy. They are so luxurious! The beautiful pink and navy packaging looks adorable in my baby's nursery too! I am excited to share some of my favorites products with you. The signature scent is one of my favorite parts of their product line - it just smells like baby to me - soft, light, perfect! I particularly love the Super Soft Lotion - it always leaves my son's skin hydrated. I recently tried the Leave-In Conditioning Hair Polish - which we use as a styling product to brush our sons hair - and I'm in LOVE! I honestly love the whole line. It all works well, hydrates and smells awesome! Noodle & Boo was founded by Christine Burger, a mother of three. 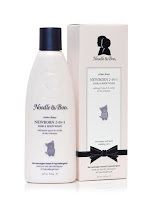 Her dedication to providing her children with suitable products for their sensitive skin resulted in her luxurious and beneficial line, Noodle & Boo. With Noodle & Boo, bath time is better than ever, as the products use only the best ingredients. 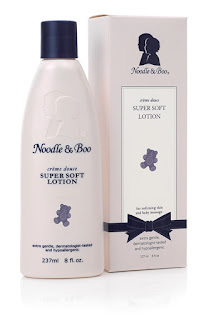 One lucky reader will win a Noodle & Boo Super Soft Lotion! I'd love to try the Noodle & Boo Conditioning Hair Polish. I'd live to try the Blissful Balm with the dry winter air coming. I think the Noodle & Boo Extra Gentle Shampoo sounds nice. The extra gentle shampoo sounds like a great product. I am most interested in the Noodle & Boo Extra Gentle Shampoo. I would love to try the Noodle & Boo Conditioning Hair Polish .